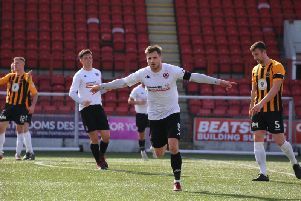 You couldn't have wiped the smile off Johnny Harvey's face on Saturday evening - the 36-year-old was rightfully delighted with his first points in the SPFL after an impressive 4-2 victory at Elgin City. The three points move Berwick Rangers five clear of Albion Rovers at the bottom of League Two, ahead of their meeting with the Coatbridge club this weekend. "I'm absolutely delighted with the three points, they are huge for us and it gives us something to catapult our season," Harvey said post-match. "The players have set the bar now and they can't ever drop below that bar. We need to hit those levels every week. If they do that, I can see us being on the way up." Harvey named two trialists in the line-up against Elgin, with both getting themselves on the scoresheet. Although unable to confirm the identity of either, the Berwickshire News believe they are centre-back Chris Hume and midfielder Lewis Barr - both of whom were released by Harvey's old club Penicuik Athletic during the week. Speaking on those trialists, Harvey added: "They are available and we are going to have a look at them over the next few weeks and see how they are accustomed to this level of football. "They have come from an East of Scotland League side, so it's up to us to assess them. I thought the two of them were terrific and are off to a great start." Speaking to the Berwickshire News, the boss then talked about his delight at his side's performance in the 4-2 success. "We can look at goals we have conceded and say they could have been better defended, but I prefer to look at the positives. "We have had a tough couple of weeks and the fact that we have scored four goals is big. I'll focus on that, but come Tuesday I'll be focused on trying to tighten up the back. "It'll be an enjoyable journey back down the road. The boys will be wanting to get in a few beers and we'll allow that." Next weekend's match with Albion is massive for Rangers, with a chance to go eight clear of the bottom. Harvey ensured the supporters that his side will be on their game. "It doesn't matter who you are playing, there are three points up for grabs. We will turn up every game from now until the end of the season, I promise the supporters that. "We'll apply ourselves properly and we'll be organised and well prepared."